This simple four ingredient chicken recipe is always a hit. Try making this with sugar-free preserves and a light Russian dressing. This is delicious with rice or mashed potatoes. 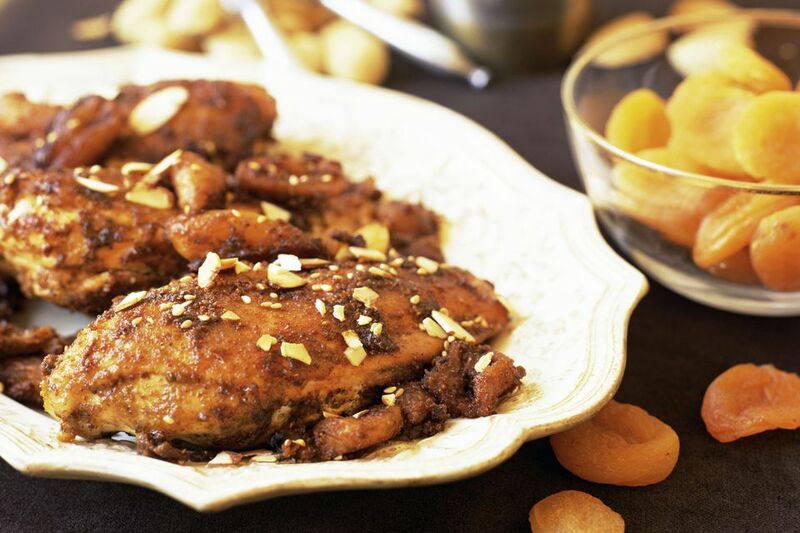 Add a garnish of toasted almonds to the chicken and serve it with rice or potatoes. Side dish suggestions include steamed broccoli, spinach, or green beans. This chicken calls for frozen chicken breasts, but this is not recommended by food safety experts, especially if you are cooking for young children, the elderly, or pregnant women. If you start with properly defrosted chicken breasts, cook for about 4 to 6 hours on low, or until the chicken is done. If you do use frozen or partially frozen chicken breasts, cook them on high for an hour before turning the pot to low. IN a bowl, combine the apricot preserves, Russian dressing, and onion soup mix; blend well. Place the chicken in the slow cooker and cover with apricot mixture. Cover the pot and cook on HIGH for 1 hour. Turn to low and cook for 3 to 4 hours longer, or until the chicken is thoroughly cooked. Serve with rice or potatoes with a garnish of slivered toasted almonds, cilantro, or parsley. Oven: Spread the slivered almonds out on a rimmed baking sheet. Bake in a preheated 350 F oven for 10 to 14 minutes, or until the nuts are lightly browned, stirring and turning every two minutes. Stovetop: Heat a dry skillet over medium heat. Add the nuts and cook, stirring, until they are golden brown, about 4 to 7 minutes.